Beautifully hand-painted and made in the USA, Heart Gifts by Teresa offers lovely ornaments with sentimental messages that are sure to become on favorite on your Christmas tree. You'll also find special messages that make these ornaments a wonderful gift! Text Reads: You're very dear to me! Text Reads: It means so much to have a friend like you! You're truly set apart with your warm and caring heart! 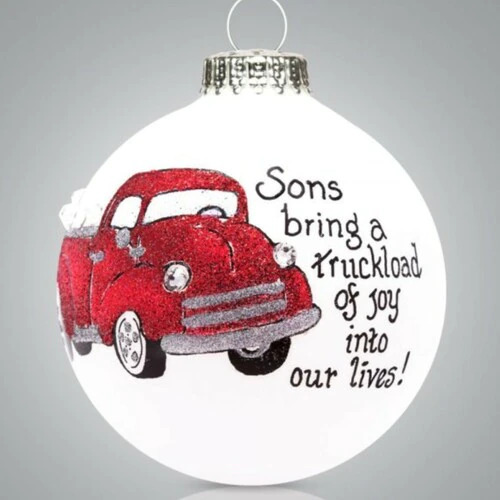 Text Reads: Sons bring a truckload of joy into our lives! Text Reads: Daughter you're 1 in a million! Text Reads: Grandma You have a heart of gold! Text Reads: Granddaughter You'll always be my cup of tea! Text Reads: Of all the gifts both great and small, Sisters are the best gift of all! Text Reads: Our First Christmas Together Meet me under the mistletoe! Text Reads: Our first Christmas in our new Home! Our site highlights some of our products. We carry the full line of all of the collectibles listed. If you need a particular piece not seen, please stop by or contact us. Call toll free 1-877-387-4646 or email us.